2000 Petitions?? At ten names per, you'll need 2,339 petitions to meet the minimum. So, you might plan on at least 500 more petitions. The other candidate who most likely will come to Traverse City is Ben Carson. It would be so unbelievably cool if they come the same day. How are decisions being made as to which local Republican Parties, memberships, elected leadership, (etc.) should be more meekly "taken back" (Battle Cry) vs recalls? A replacement candidate already in place? "Good relationships" with local Republicans? A grassroots precinct delegate game plan which "can't miss"? It seems that many of us out here are simply asking what our local game plan even is or who our local patriots even are with the 'gall' of such patriots running these recalls. With no post-party word from Battle Cry clearly evident and time quickly running out..who else around the state (by district) is standing tall or taking fire 'more' than these heroes circulating the word first-hand or what exactly is 'their' plan? People aren't going to join a cause if they don't even know (locally) who is carrying the flag in what direction or why. If we believe (now) that this all has to be done in backrooms or 'in person' with this little time left in an election cycle?...we're kidding ourselves in terms of how much needs be done and what people expect. We have petition Captains in 6 of 8 counties, and really don't need to cover the other two..
Yep. All the same old crap being peddled here. Zero foresight, very much living off the profitability of hindsight. JD I don't understand your post--1. you asked: "How are decisions being made as to which local Republican Parties, memberships, elected leadership, (etc.) should be more meekly "taken back". . ." ANS: We are a limited representative republic and when our representatives fail to represent, it is necessary to recall. There's no decision--it's a duty. Are you not doing your duty??? 2. Do you need an update re: BattleCry? Here goes--I go to these things to network with like minds from across the state. I'm grateful for this opportunity to do so. A ballroom full of folks who've got the inside scoop from across the state (and as far away as Penn.) You ask about good relationships with local GOP--but does anyone have a good relationship with the likes of Wayne Schmidt or a Darwin Booher? Oh my Goodness--even the GOP doesn't agree. 3. You next said "People aren't going to join a cause if they don't even know (locally) who is carrying the flag . . ." ANS: Instead of asking who the leader is--become the leader. Go to your county clerk's office, ask for an Affidavit of Identity, fill it out right there and place your name on the ballot as a precinct delegate and get elected. You have until May 3, 2016 to do this. Once elected, you'll be summoned to the county convention and can try to get elected a delegate to the state convention--even an alternate will do. At this state convention, your congressional district will hold a vote for delegate to the Electoral College. There are also many other opportunities like election to the State Executive Committee, etc. This sounds time consuming, but it's really not. A precinct delegate is an elected official giving you that extra oomph you sound like you need. Again, you are the boss--you own the government--that being said, now go do your duty. As a side note, at Battlecry they asked how many folks were precinct delegates--I would say, more than 85%. present. As for recalls--we are limited to who we may recall to those bad dudes supposedly representing us. For Mr. Backers, his senator is Wayne Schmidt. When 80% of the voters yell NO NEW TAXES they have a responsibility--no a DUTY to not vote in the exact same tax we voters said a resounding NONONONONO to. These new tax laws of 11/3/15 actually has the exact same language as the ballot proposal we said NONONONONONONO to. I find this egregious and offensive. On December 15, 2015, Booher actually introduced a resolution to repeal the "New" gas tax--sounds good but wants to raise the sales tax instead--Again, we already said NONONONONONONONONONONO. So, his recall and Arlan Meekoff's are in the works by folks they supposedly represent. (Sue said):"..We are a limited representative republic and when our representatives fail to represent, it is necessary to recall. There's no decision--it's a duty. Are you not doing your duty???.. :"
They've all failed, Sue (even McMillin on SB 1129 of 2012)...so the question has always been...what are we doing about it? If there isn't grassroots support for a recall (i.e. : 98% of districts in 2016 not already running a candidate that would benefit from one) why can't we receive real time background/news on those in our local Republican Party SUPPORTING 98% of the unchallenged? Aren't these 'radical' precinct delegates imagining a 'different' strategy our #1 source for this information? Or have many of them been corrupted by the same establishment Party members that are proud of supporting the old guard...and always will be? These 'inside' patriots perpetually remain silent as to what is (actually) happening in the (local) Party we're supposed to be "taking back"..because why? (Sue said):"...Do you need an update re: BattleCry? Here goes--I go to these things to network with like minds from across the state. I'm grateful for this opportunity to do so. A ballroom full of folks who've got the inside scoop from across the state (and as far away as Penn.) You ask about good relationships with local GOP--but does anyone have a good relationship with the likes of Wayne Schmidt or a Darwin Booher? Oh my Goodness--even the GOP doesn't agree. .."
How much anybody enjoyed the like-mindedness or inside scoops from "across the state" (or even nation) means very little for those seeking an actual real time update as to what is going on right outside their front doors. We don't need to hear about how some lifetime GOP establishment supporter doesn't necessarily agree with anybody as they predictably go ahead and support them anyways. These people are a dime a dozen and sent out there to appease every precinct delegate that they come across. We're out here thirsting for how a precinct delegate doesn't necessarily ALLOW closet RINO Party glad-handlers to, say, hide elected officials from the general public's questions on a regular basis. If THEY aren't being backed in to corners at Party gatherings any more than those that they are effectively protecting..guess what?..we're questioning the strategy to begin with. (Sue said):"..3. You next said "People aren't going to join a cause if they don't even know (locally) who is carrying the flag . . ." ANS: Instead of asking who the leader is--become the leader. Go to your county clerk's office, ask for an Affidavit of Identity, fill it out right there and place your name on the ballot as a precinct delegate and get elected. You have until May 3, 2016 to do this. Once elected, you'll be summoned to the county convention and can try to get elected a delegate to the state convention--even an alternate will do. At this state convention, your congressional district will hold a vote for delegate to the Electoral College. There are also many other opportunities like election to the State Executive Committee, etc. This sounds time consuming, but it's really not. A precinct delegate is an elected official giving you that extra oomph you sound like you need. Again, you are the boss--you own the government--that being said, now go do your duty. As a side note, at Battlecry they asked how many folks were precinct delegates--I would say, more than 85%. present..."
Patriots aren't signing up for this Sue as they aren't getting any feedback as to what it is actually 'like' to venture in to the belly of the beast that is any Party locally. They are all different with some patriots willing to stand up more than others in terms of questioning the most powerful in their communities on the most basic of principles involving our children's future. Changing the way that things have been done in the good 'ol boys club goes well beyond whatever happens in ANY party. We are simply asking if indeed this no-more-b.s. mindset is present in the precinct delegate strategy...or if the "agree to disagree" (purposely delay) nonsense that has seemingly prevailed to date (and just fine with the party) is epidemic in the precinct delegate movement across this state. 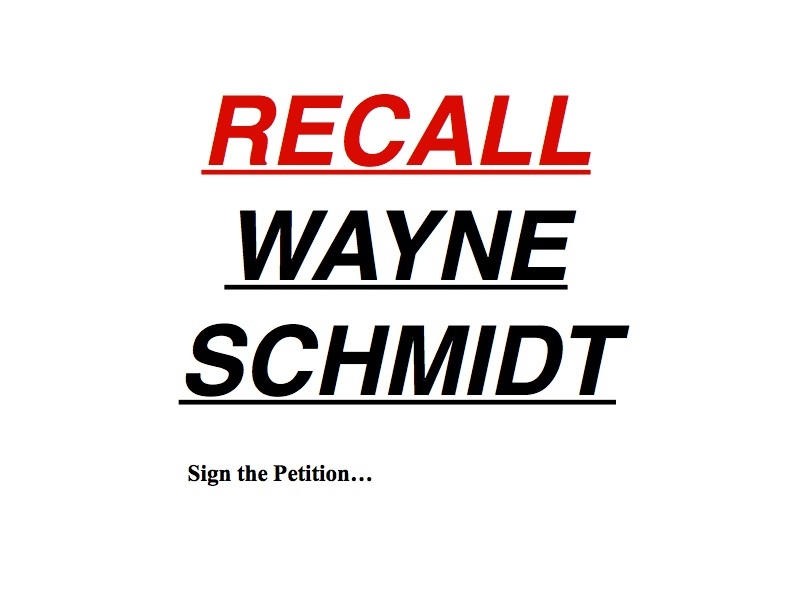 Anybody with half a brain will sign these recall petitions and may God bless those organizing and circulating them. Confronting those supporting the power structure in our communities on a regular basis and getting the word out as to how this arrogance needs to be quickly documented, disassembled and rebuilt (in record time) seems to be the issue but 9 months before the most historic election in state history. Just my $.02 and obviously respective of anybody's opinion otherwise. It may just be that you have more support than even you realize in those who would stand and be "absolutely confrontational" as you put it. What doesn't seem to be getting across here is that each legislative district deserves to know exactly who that person or people are in order to join anything or to even mount a token effort in terms of recalling anybody (locally). If certain district patriots are less willing than others to become politically "confrontational" well that just may be what many of us have experienced to date and even understandable. Conversely, if there are those in districts all across the state waiting to pop up tomorrow at your unveil with petitions in hand; I would be surprised if they didn't garner immediate support of some kind or another should the closest district to each patriot be revealed on a map or other means. Then why are you even here?????????????? Dear JD--i feel your frustration 100 fold. I feel it's not as hopeless as you think. I've always felt that you find your issue and run with it. I have a friend who wants animal rights--I do not fault her in this; as it would do me no good to tell her that animals are property and have no rights--it's just plain silly to give animals "rights"--but hey, that's me. Right now, everyone seems to be consumed by the Flint situation. It is humorous to me that the solution is cases of 10 oz plastic bottled water. What???? People all over the country are sending bottled water to Flint creating yet another problem of Plastic pollution. Firstly, your house plumbing is YOUR responsibility. You see brown water coming out of your tap, and you really give this to your children???? No, you take steps to filter your water to make it safe without any govt involvement right? Secondly, doesn't it make more sense for these folks to file claims with their homeowners' insurance and let them duke it out. And thirdly, if the state and feds really want to fix this, give homeowners no interest loans to put whole house filters in. The loan will be paid back when the property is sold. If the filter is good, its not even necessary for water softeners or to even change the water from the Flint River back to the Detroit system. But that's the sane solution. So, I'm guessing you'll run to your county clerk and file that affidavit-of-identity and place your name on the ballot. Then you'll become one of those folks you describe and know all our secrets. BTW, this writer has been a precinct delegate off and on for about 40 years--and, it's humorous to me that just in the last couple of years, this is now the strategy that I knew and understood way back when. Welcome aboard JD and I look forward to meeting you at the September State Convention. From past experience with local 'conservative' Republicans...I'd just as soon know exactly who I am dealing with (in detail) before jumping in to a 40 year relationship let alone an obvious full blown 'plot' to overthrow a local Party that they haven't been thrown out of already. "Keep your enemies closer" seems to have been an effective strategy for the MI-GOP so far and party membership has always been an 'at will' relationship (at best). If a district is made up of less than hard-core types...great. Yet the TP strategy to date has split the hair separating those two vastly different scenarios ineffectively (in my opinion) leaving many wondering what their local 'conservative' movement is really all about.